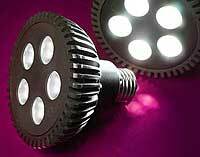 The latest generation of PAR30-Style LED spotlight bulbs from LEDtronics is made up of five three-Watt high-power LEDs. The LED bulbs are direct incandescent PAR30 replacements, combining advanced Light Emitting Diode technologies, standard 25mm Edison screw-in bases, and designs producing 480 to 544 lumens of light depending on the bulb model. Bulbs are available in a 40-degree light-emitting viewing angle, running on 80V to 260V AC current. Other voltages like 12Volt AC or DC are optionally available.